Brockham Bonfire Forecast Saturday 2 Nov: windy with a high chance of meatballs: enjoy the show! SE escapes the worst of the rain! NOTE: that the strongest gusts recorded in Reigate during StJude were 48mph, which brought down big trees, so these are potentially strong gusts forecast for tomorrow which could bring down branches. The weather for Brockham Bonfire, Surrey, on Saturday afternoon and evening looks certain to get blustery later with SSW-SW winds of 22mph and possibly gusting nearly 35-40mph but thankfully it stays mostly dry! 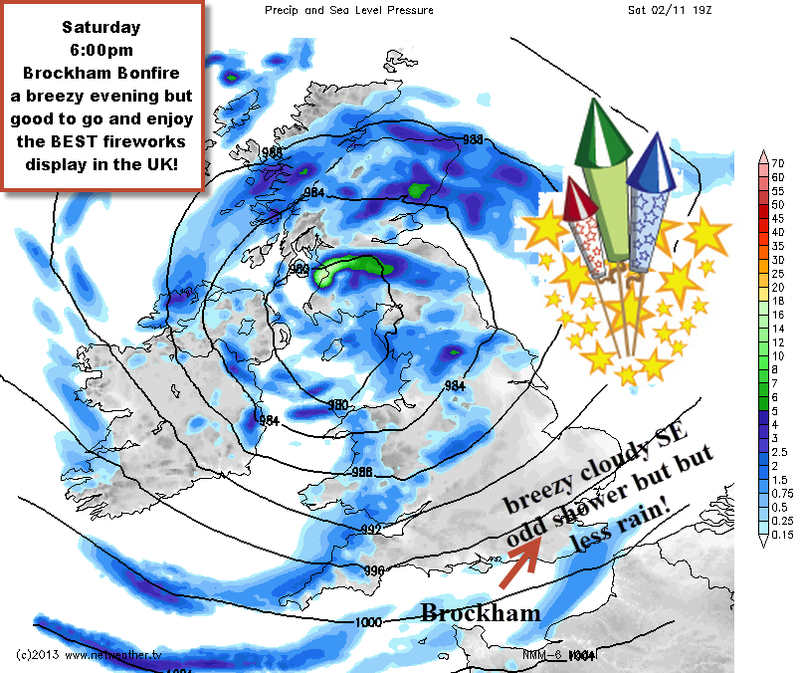 So leave the umbrella behind (it’ll be annoying and “difficult” and a waste of time in the breeze, with hardly much rain anyhow) and go go go: it’ll be a brisk windy evening at the biggest and most exciting bonfire and fireworks event in the UK! It even looks like low clouds and any showers will hopefully move through quickly and so skies will not be too murky so the fireworks will look spectacular, albeit organisers will need to be careful in how they manage the winds with smoke, fire and the fireworks: it will be unusually windy. The main feature of the weather during Saturday pm will be the increasing winds from the SSW-SW. This will blow smoke away from the Church end and over the Green to the NE, but local effects might change the precise smoke plume, especially with high winds: keeping it potentially quite low and squally, watch out for sparks! Any rain at the moment looks to be showery in nature but mostly light and flying across quickly in the wind earlier in the evening, perhaps passing through at about 4-6pm but clearing off quickly and leaving a dry evening. The situation is fast moving, of course, so things can change… please check back our twitter feed for updates and nowcasting! Have fun and enjoy Brockham 2013!